Lemon’s sweet and tart taste makes them an unforgettable addition to any snack, dish, or drink. However, adding lemon to your diet also has a variety of health benefits that can help fuel your weight loss goals. Lemons are actually packed with vitamins and nutrients that make it a powerful addition to your diet. Lemons help support heart health, weight control, digestive health, and more. We’ve compiled a list of the best health benefits of lemons that can help improve your health and weight-loss journey. 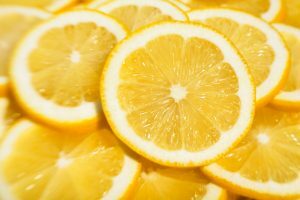 Lemons are often promoted as a weight loss food, and there’s a good reason why. They contain a fiber that expands in your stomach, helping you to feel full for longer. However, since lemons are rarely eaten whole, the fiber’s power to control your hunger won’t be as drastic. Yet, even small doses or extracts of lemon have been shown to help people lose weight. Drinking water with lemon is a great way to speed up your weight-loss goals. Both the water and the lemon will help temporarily increase the number of calories you burn. Also, studies of the plant compounds in lemons have been proven to help reduce or prevent weight gain in a variety of ways. Add a splash of lemon to your drink for extra health benefits and a sweet taste that encourages you to stay hydrated. Lemons are bursting with vitamin C. In fact, one lemon contains about 31 mg of vitamin C or 51% of your daily recommended intake. Research proves that eating fruits and vegetables high in vitamin C can greatly help reduce the risk of heart disease and stroke. Similarly, the plant compounds in lemons have been shown to help lower cholesterol and significantly reduce heart disease risks. Add a dash of lemon to your next dish to keep your heart healthy and strong. The main fiber found in lemons, pectin, is a soluble fiber that is proven to have a multitude of health benefits. However, it’s important to note that in order to get the full benefits of the fiber in lemons you must eat their pulp and skin, not just the juice. The soluble fiber in lemons can help to improve your gut health immensely which is proven to boost your immune system simultaneously. Lemon’s powerful fiber can also help slow the digestion of sugars and starches and can help reduce blood sugar levels in a natural way. Don’t forget the importance of the pulp and skin when using lemon to help improve your weight-loss goals and overall health.